Chicago is a city I’d like to get to know better, but circumstances have only brought me there twice. The first time was last summer, when my mother and I rode the train across the country; we had a one-day stopover in Chicago. The second time was this past weekend, when the annual meeting of the Association for Asian Studies was held in the city. Of course, being there for a conference meant that I didn’t have much time to explore. I mostly saw my hotel, the conference meeting rooms, and the Whole Foods across the street where large numbers of conference-goers ran to grab a quick lunch. But I booked a late flight back on Sunday (which became a later flight back due to delays) to give myself a little bit of Chicago time after AAS ended. Sunday morning had been clear and sunny, but as I walked down to Millennium Park it started to hail. 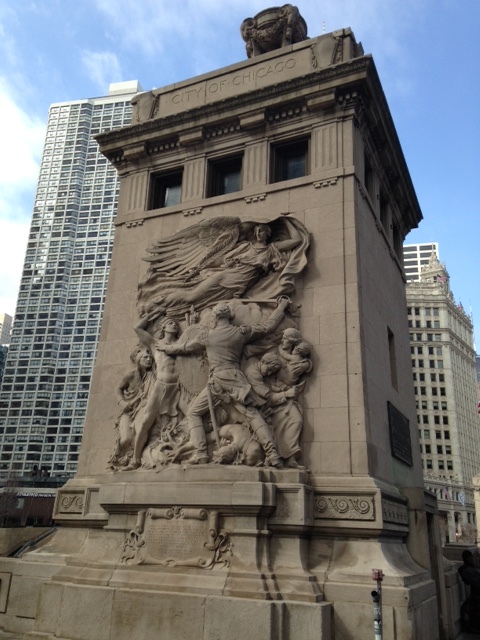 And then, true to the city’s nickname, it got windy—so windy I was blown a few steps sideways as I crossed the street! 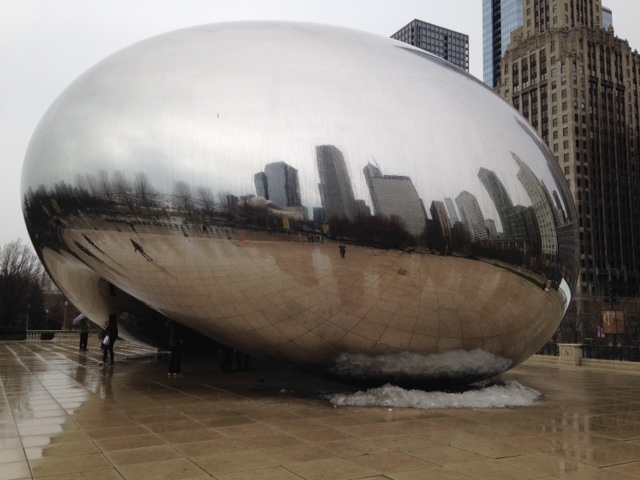 So I saw “the Bean” (technically named Cloud Gate) in the rain and hail. It was actually kind of pretty, but I wasn’t inclined to linger. Heading to the south end of the park, I made a very quick visit to the Art Institute of Chicago. I saw the featured exhibit (“Ireland: Crossroads of Art and Design, 1690–1840”) and the museum’s most famous pieces of art, like American Gothic and Edward Hopper’s Nighthawks. But the Art Institute is massive and my time was limited, so I couldn’t wander around as much as I would have liked. Leaving the museum, the rain/hail had stopped, though it was still overcast, and I was ready for a quick lunch. 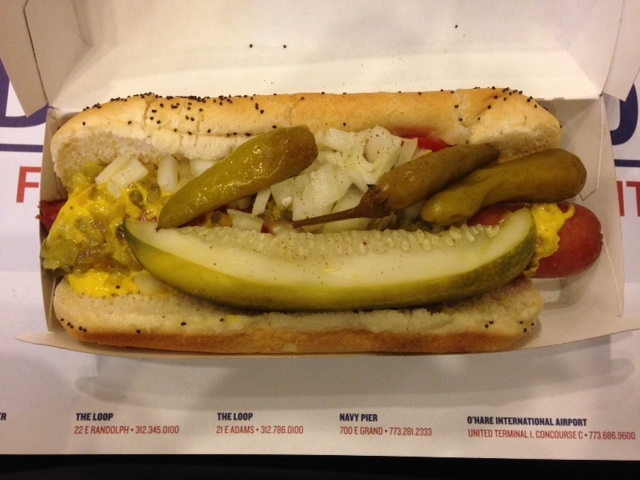 No question of what to eat—I had to have a Chicago hot dog before I left. Google Maps told me that there was an America’s Dog outlet just to the west of the park. I then walked down the street and bought some caramel popcorn at Garrett’s to bring back to New York for my office to share (though there were moments when I was tempted to keep the entire bag for myself!). I walked north along State Street to head back to my hotel. 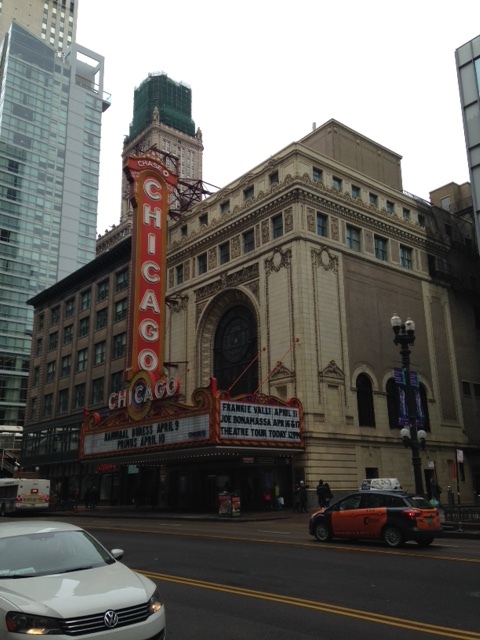 I stopped to take a few photos of the Chicago Theatre, with the nagging feeling in the back of my mind that I recognized it from somewhere. Hours later, I remembered: the opening credits from Perfect Strangers, a (probably terrible) sitcom I watched as a kid. All of a sudden, the sun came out and the sky was blue again, so I had perfect weather as I crossed the river one last time. I collected my bags at the hotel, got on the L, and headed out to O’Hare. Eight hours later (!) I walked in my front door having, once again, just gotten the briefest taste of Chicago. 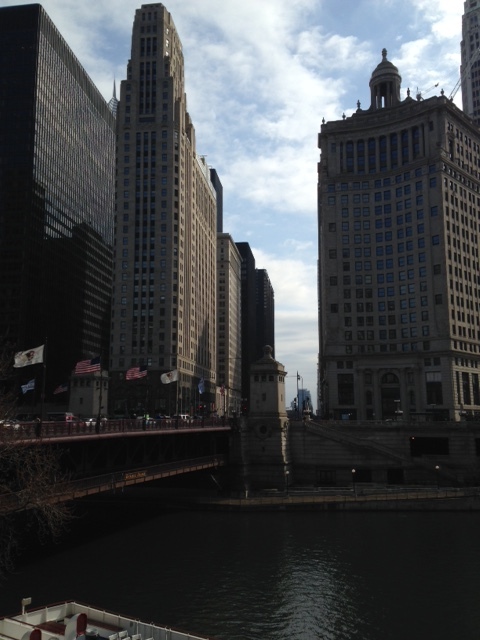 My all time favorite American city…….